Syracuse is back in the Final Four for men’s basketball! The Orange are making their second trip to college basketball’s biggest stage in the last four seasons, the shortest time between trips for the school in the history of the program which has now reached six Final Fours. This is the fifth time that Syracuse coach Jim Boeheim has lead the Orange to the Final Four in this his 40th year as head coach of his alma mater. Syracuse punched its ticket to the Final Four with a thrilling 68-62 win over top-seeded Virginia in the NCAA Tournament’s Midwest Regional final on Sunday March 27 at the United Center in Chicago. The Orange overcame a 16-point second-half deficit to post the victory. Jim Boeheim will be coaching in his fifth Final Four as head coach of the Orange. Syracuse is only the fourth double digit seed to ever advance to the Final Four and the first 10 seed to do so. The Orange will face Atlantic Coast Conference rival North Carolina in the national semifinals at NRG Stadium in Houston, TX. The Tarheels, the East Regional champions, are the tournament’s only number one seed to make it to the Final Four. A pair of two seeds will collide in the other national semifinal with South Regional champion Villanova meeting West Regional champion Oklahoma. This improbable run by Syracuse marks what March Madness is all about. Living on the edge. Dramatic finishes behind thrilling comeback efforts. A team that was on the NCAA bubble but has shown why they deserved to be in the tournament. A gutsy and gritty team that has thrived off their chemistry. The Orange have only been ranked once all season which was on November 30 when they placed 14th in the AP top 25 poll and 19th in the USA Today Coaches Poll. They have only received votes on three other occasions during the season with those coming on December 7 and 14 and again on February 15. Syracuse was not even ranked in either of these preseason polls. Although schools like UCLA (17, 11), Kentucky (17, 8), Duke (16, 5), Kansas (14, 3), Indiana (8, 5), Ohio State (10, 1), Michigan State (9, 2), and Louisville (10, 3) are college basketball thoroughbreds with a combined 101 Final Four appearances and 38 NCAA championships among them, the Orange program has its own high caliber history. The Syracuse program has stood the test of time by reaching at least one Final Four in every decade since the 1970’s started. That peaked in 2003 when the Orange won its’ only national championship. 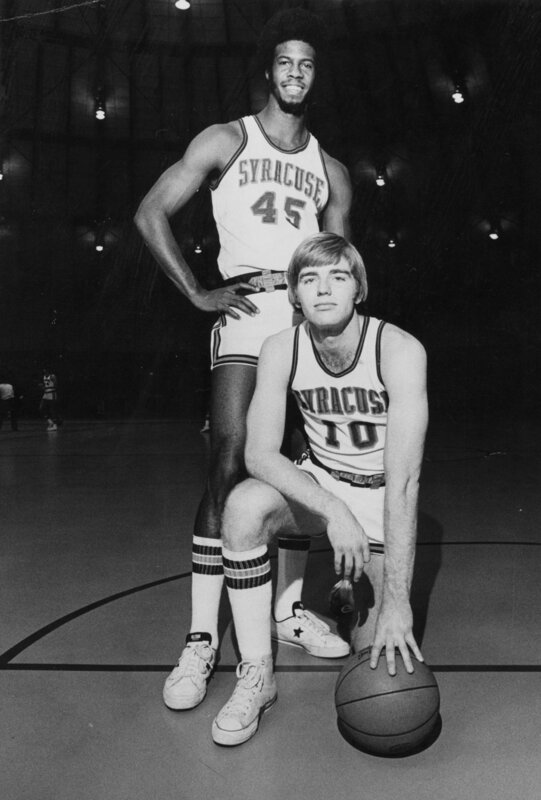 Boeheim was an assistant coach on the 1974-75 Syracuse team that reached the school’s first Final Four. This is the first time that the Orange have made two trips to the Final Four in the same decade. Furthermore, Boeheim and Syracuse have made some of their loudest statements by beating some of those storied aforementioned schools in their Final Four seasons. The NCAA Tournament history of the Orange includes two wins each against Kansas and North Carolina and one win over Indiana in years that they went to the Final Four. Syracuse beat Kansas in the 1996 West Regional final and defeated them to win it all in 2003. The Orange beat North Carolina 78-76 in the semifinal of the East Regional in 1975 and again in the 1987 East Regional final. Syracuse’s win over Indiana came in the Sweet 16 in 2013. 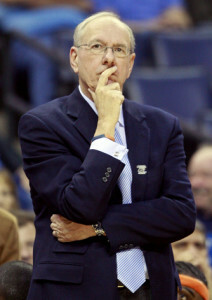 Boeheim was elected to the Naismith Memorial Basketball Hall of Fame in 2005 and has beaten fellow hall-of-famers in Dean Smith, Roy Williams, and Rick Pitino in NCAA Tournament play at least once each. This all supports the fact that Boeheim and the Orange program have risen to beat some of the best in the game when the stakes are the highest. In the process, he has positioned Syracuse in the national spotlight consistently throughout his career as a national contender year in and year out, despite not having the same NCAA Tournament accomplishments of other storied schools as is measured in quantity. However quality has always been there and has continued even after reaching the program’s pinnacle in 2003. Since cutting down the nets as national champions 13 years ago, Boeheim has had the Orange in postseason play every year but one including 10 trips to the NCAA Tournament. During that same time, he has also led Syracuse to two Big East outright regular season championships (2010, ‘12), guided the Orange to four appearances (2005, ’06, ’09, ’13) and two wins (2005, ’06) in Big East Tournament championship games, had multiple teams rise to the number one ranking in the country, lead two teams to number one seeds in the NCAA Tournament (2010, ’12), garnered the AP national coach-of-the-year honor in 2010, and lead Syracuse to a school record 25-0 start (2013-14). Boeheim has done some of the best work of his career during this time and the teams, players, and coaches he has had reflect nothing but class and excellence for his program as well as the game. Despite not always getting the top 20 recruits to become part of the Orange, Boeheim has been a steady example of how to use coaching, leadership, and a fierce competitive nature to get the best out of his players and teams as a whole. While he has had talented players on his Final Four teams such as Derrick Coleman, John Wallace, Carmelo Anthony, and Michael Carter-Williams, an equally important factor if not more has been the chemistry he has had on his teams. Chemistry refers to the way people work together in their interactions with one another. The more everyone can work together in support of a common goal, the better chemistry they have and this can have a positive impact on winning. Boeheim is the epitome of this and it has always stood out as an admirable quality in his coaching over his 40 years at the helm. Chemistry is something that has been a common thread to all the Final Four teams in Syracuse history. The Orange have had a talented key player on each of their Final Four teams. However their other four starters over the years have been highly productive making them multi-dimensional. For example Howard Triche and Greg Monroe were senior co-captains that brought steady production and leadership during the school’s 1987 Final Four season. Even when Syracuse won the national title in 2003, he had serviceable role players come off the bench in Billy Edelin, Josh Pace, and Jeremy McNeil. While Boeheim has not always had a lot of depth, he has still been able to turn to a player or two off the bench to contribute and battle the opposing coach with the matchup game. Look no further to a player like Steven Thompson who was a key reserve on the 1987 Final Four team and then started for three more years. Over the years, the Orange have played a lot of thrilling games that have captivated the hearts of Syracuse fans throughout Central, NY and captured national television audiences. There have been thrilling and dramatic finishes and elaborate wins where the Orange strutted their stuff. So here is a trip down memory lane for Syracuse fans and alumni of the program. The school’s five previous trips to the Final Four have been exciting. More thrilling dramatics could be in store in Houston this weekend. Here is a look back at what the Orange have done in their previous trips to the Final Four. Perhaps this look back offers a glimpse into the immediate future for Syracuse. If nothing else, thrilling competition usually takes place when the Orange are in the Final Four. Rudy Hackett (standing) and Jim Lee (kneeling) lead Syracuse to its’ first Final Four in 1975.
the day when the NCAA field had only 32 teams. Syracuse trailed the Wildcats 44-32 at the half in this national semifinal which was played in San Diego, CA. The Orange trailed by 20 points at one point in the second half and would get no closer than 10 points as Kentucky advanced to the national championship game where they lost to UCLA in what was the last national title for the late John Wooden, legendary coach of the Bruins. rebounds. Syracuse was lead by Jimmy Lee’s 23 points while Christopher Sease scored 18 points and grabbed a team-best eight rebounds. Rudy Hackett added 14 points. At this time in NCAA Tournament history, there was a third place game that was held which pitted the two teams that lost in the national semifinals. Thus, the Orange went on to play in the third place game and lost to Louisville 96-88. Syracuse was out-rebounded in the game 53-34 and shot 43.0 percent from the field compared to 54.2 percent for Louisville. Jim Boeheim was on the bench as an assistant coach for the Orange in this one and would gain meaningful first hand insight into coaching at the Final Four. Boeheim’s first trip to the Final Four as head coach of the Orange was clinched with a 79-75 win over top-seeded North Carolina in the East Regional final in 1987. That sent him and the team to the Superdome in New Orleans, LA where he faced off against Rick Pitino, his former assistant coach at Syracuse. Pitino lead Providence College, a sixth seed, to a surprise trip to the Final Four with an 88-73 upset of top-seeded Georgetown in the Southeast Regional final that year. Senior co-captain Greg Monroe lead the Orange with 17 points while Rony Seikaly added 16. Syracuse played an efficient game and benefitted from a balanced scoring attack with Howard Triche, Sherman Douglas, and Derrick Coleman scoring 12 points apiece. Coleman also grabbed a game-high 12 rebounds while Triche and Douglas had 11 each. The Orange advanced to Boeheim’s first NCAA Championship game with a 77-63 win over the Friars. Indiana beat UNLV 97-93 in the other semifinal. In a classic matchup between the best of the Big East and the Big Ten conferences, Syracuse and Indiana played one of the most dramatic games in NCAA men’s title game history. The two teams exchanged leads during a back-and-forth first half that saw Indiana’s Steve Alford close the first half with a three-pointer that gave the Hoosiers a 34-33 lead at intermission. The Orange lead 52-44 with 13:05 left in the second half before Indiana went on a 10-0 run to take a 54-52 lead with 9:31 left. Syracuse answered with a 7-0 run to regain the lead 59-54 at the eight minute mark. That five-point margin would be the largest lead that would exist for either side the rest of the way as the two teams battled back-and-forth with clutch plays by both sides in the closing minutes. 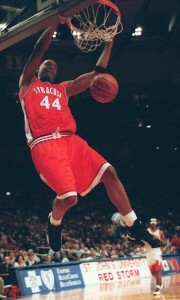 Orange legend Derrick Coleman grabbed 19 rebounds against the Hoosiers in the 1987 NCAA title game. With the score knotted at 68, Seikaly gave the Orange a 70-68 lead by banking in a short layup and was fouled. His missed free throw resulted in Coleman’s 19th rebound allowing Syracuse to keep possession with 1:57 left enabling the Orange to use up a fresh shot clock which then stood at 45 seconds. Smart then hit a driving layup with 1:21 left to force a 70-70 tie. The ensuing possession saw Triche convert a short layup over the front of the rim off an assist from Monroe giving Syracuse a 72-70 lead with 55 seconds left to play. Smart then missed a short baseline jumper and Triche grabbed the rebound and was immediately fouled with 38 seconds left. Indiana coach Bobby Knight chose to ice Triche by calling timeout. Triche converted the first free throw but missed the second one leaving the Orange up 73-70. Smart got the rebound and dribbled the length of the court before hitting a short shot in the lane pulling Indiana to within one at 73-72 with 30 seconds left. Indiana fouled Coleman immediately on the inbounds but Coleman missed the front end of the one and one with 28 seconds left. Boeheim and Syracuse had chosen to have none of their players under the basket to rebound as Coleman shot the free throw. Operating on the left side of the court, Keith Smart took a pass from teammate Daryl Thomas and took one dribble toward the baseline before elevating and sinking a soft jumper over the outstretched arms of Triche. It was the dagger that killed the dreams of the Orange and their faithful fans as Indiana won 74-73. There was one second left on the clock but an inbounds pass went for naught as Smart intercepted it preventing one last heave by Syracuse. Douglas scored 20 points and had seven assists to lead the Orange which got 18 points and 10 rebounds from Seikaly. Coleman scored eight points and set the school’s single game record for rebounds in an NCAA Tournament game with 19, a mark that still stands today. Monroe finished with 12 points and 3 assists. Syracuse shot only 55 percent from the foul line (11-for-20) and missed three of its’ last four foul shots which all came in the last two minutes. Alford hit seven three-pointers en route to 23 points to lead the Hoosiers who got 20-point performances from Thomas (20) and Smart (21). Dean Garrett added 10 points and 10 rebounds. This trip was memorable as the Orange opened the season unranked. A Syracuse team featuring senior forward John Wallace – who had decided to return for his senior season rather than declare for the NBA Draft – and senior guard Lazarus Sims lead the Orange on a remarkable journey to the Final Four, the school’s third ever trip. Seeded fourth in the West Region in the NCAA Tournament, Syracuse defeated lower seeds Montana State (13) and Drexel (12) in the first and second rounds respectively to advance to the Sweet 16. There, they met the Georgia Bulldogs who at the time were coached by Tubby Smith who would go onto lead Kentucky to the 1998 National Championship. Trailing 70-68 with 2.4 seconds left in regulation, Wallace found Jason Cipolla on an inbounds play from near half court. Cipolla sank a baseline jumper to force overtime. In the extra session, Syracuse again was facing near elimination in the final 20 seconds. With 14.8 seconds left, Wallace received a lob pass from Sims and converted a layup in the low post putting the Orange up 80-78. The ensuing possession saw Georgia hit a three-pointer to take an 81-80 lead with only 7.1 seconds left. Wallace took the ensuing inbounds pass and dribbled the length of the court and hit a three-point basket from the top of the arc putting Syracuse back up 83-81 with 2.8 seconds left. Georgia’s last attempt at a shot failed and the Orange had pulled out a miraculous victory. Wallace’s 30 points and 15 rebounds lead Syracuse which got double figure scoring efforts from Otis Hill (19), Cipolla (17), and Sims (10). Sims also dished out 10 assists. The victory sent the Orange onto play second-seeded Kansas in the West Regional final. There, Syracuse defeated the Jayhawks 60-57 to advance to the Final Four at the Continental Airlines Arena in East Rutherford, NJ. Wallace and Hill scored 15 points apiece for the Orange which got 11 from Cipolla. Both teams shot low percentages with Syracuse holding Kansas to 34.4 percent on the day. The Jayhawks featured the likes of Paul Pierce, Raef LaFrentz, Scott Pollard, and Jacque Vaughn who all went on to pro careers. John Wallace scored 29 points against Kentucky in the 1996 NCAA final before fouling out. vaunted 2-3 zone defense and balanced offensive attack. Todd Burgan hit a pair of free throw to give the Orange a 66-55 lead with three minutes left to play. Syracuse went on to hit some more free throws down the stretch en route to a 77-69 win that sent them into the championship game against Kentucky, champions of the Midwest Regional where they were the top seed. The Wildcats beat Massachusetts 81-74 in the other semifinal. back in the second half. Facing Rick Pitino, his understudy, for the second time in the Final Four, Boeheim battled head to head with his former assistant. Kentucky lead 59-46 with 11:00 left before a 16-5 Orange run brought Syracuse to within 64-62 with 4:42 left. However that is as close as the Orange would get the rest of the way as the Wildcats maintained the lead by closing the game on a 12-5 run en route to a 76-67 victory. Wallace lead Syracuse with 29 points and 10 rebounds before fouling out while Burgan had 19 points and eight rebounds. Hill added 10 rebounds to go with seven points add Sims scored six points and had a team high seven assists. Kentucky was lead by Tony Delk’s 24 points while Ron Mercer added 20 points. Antoine Walker and Derek Anderson each scored 11 points with Walker adding a team high nine rebounds. Returning to the site where Keith Smart broke the hearts of the Syracuse team and its’ fans in 1987, Boeheim and the Orange rode the youthful exuberance of a young and talented team featuring two key freshman in guard Gerry McNamara and all-around forward Carmelo Anthony. Absent from the NCAA Tournament in 2002, Syracuse came back strong during the 2002-03 season as they won the school’s first ever NCAA championship in the sport. After defeating Manhattan and Oklahoma State in the first two rounds in Boston, MA, it was onto the East Regional in Albany, NY. After a 79-78 win over Auburn in the Sweet 16, the third-seeded Orange defeated top-seeded Oklahoma 63-47 in the regional final to advance to The Final Four at the Superdome in New Orleans, LA. 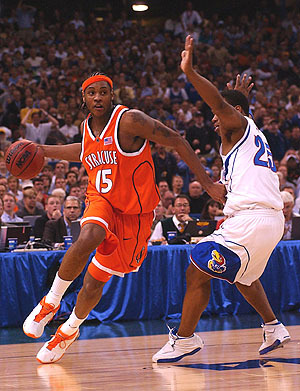 Freshman sensation Carmelo Anthony lead Syracuse to the national title in 2003. Standing in their way was more competition from the Big 12. Syracuse beat top-seeded Texas, champions of the South Regional, to advance to the title game against Kansas who had beaten Marquette 94-61 in the other national semifinal. Anthony set a Final Four freshman scoring record with 33 points and grabbed 14 rebounds against Texas while McNamara added 19 points. Hakim Warrick scored 18 points and grabbed seven rebounds as the Orange advanced to the championship game for the third time in school history. McNamara erupted in the title game with a 6-for-10 shooting effort from 3-point range for all of his 18 points which all came in the first half. Anthony lead Syracuse with 20 points, 10 rebounds, and seven assists. Leading 53-42 at the half, the Orange saw Kansas slowly creep back in it in the second 20 minutes. Syracuse lead 72-62 with 7:10 left to play. Kansas closed to within 78-73 before Orange reserve guard Billy Edelin drove the lane and hit a floating layup for an 80-73 Syracuse lead with 2:03 left. The Orange would find themselves up 80-78 with 24 seconds remaining when Syracuse senior guard Kueth Duany was fouled by Kansas. Duany missed the first of two shots but made the second putting the Orange up three, 81-78. Kansas guard Kirk Hinrich then missed a three-pointer and Warrick grabbed the rebound and was fouled. Warrick then missed both free throws leaving Kansas a chance to tie it with 13.5 seconds left. After rebounding Warrick’s second miss from the line, the Jayhawks rushed the ball up the court. Hinrich dished to the wing where Michael Lee took a 3-pointer only to have it blocked by a leaping Warrick with 0.7 seconds left showing on the clock. After official’s review determined that there should be 1.5 seconds left on the clock, the teams prepared for an inbound play. Hinrich’s last shot attempt was off the mark leaving Boeheim and Syracuse with their first national title. Nick Collison lead Kansas with 19 points and 21 rebounds while Hinrich added 16 points and four assists. Syracuse received a four seed in the East Region and beat Montana and California in the first two rounds of the NCAA Tournament. That set up a date with Indiana in the Sweet 16 of the East Region which was played in Washington DC. The Hoosiers were the top seed in the East Regional and it was the first time that the Orange had faced the Hoosiers in the tournament since their last second loss to them in the 1987 NCAA championship game. Michael Carter-Williams helped lead the Orange to the Final Four in 2013. 61-50 win. Next up was Marquette in the Elite Eight. The Golden Eagles were the third seed in the East Regional and had handed the Orange a 74-71 loss during the regular season in Big East play. Behind an aggressive and stifling 2-3 zone defense, Syracuse stifled Marquette, holding them to 12-for-53 shooting for the game, good for just 22.6 percent en route to a 55-39 victory. James Southerland lead the Orange with 16 points while Fair and Carter-Williams added 13 and 12 points respectively. The win sent Syracuse to meet Michigan in the national semifinals. The Orange trailed 36-25 at the half which was its’ largest halftime deficit of the season. Syracuse used runs of 7-3 and 9-2 in the second half to cut into Michigan’s lead. James Southerland’s three-pointer inside of one minute left to play brought the Orange to within one at 57-56 before Michigan closed out the win with four straight points to end the season for Syracuse. Fair had 22 points to lead the Orange while Brandon Triche scored 11 points and lead Syracuse with eight assists. Louisville beat Wichita State 72-68 in the other semifinal before beating Michigan 82-76 in the championship game.